Our Gift Box contains one dozen cookies. 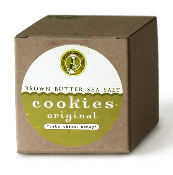 The Original Brown Butter Sea Salt cookie is our version of a shortbread cookie. We gently brown the butter to bring out the flavor and combine it with brown sugar and vanilla. After hand rolling each cookie, we top them with a touch of sea salt as they come out of the oven. Enjoy!